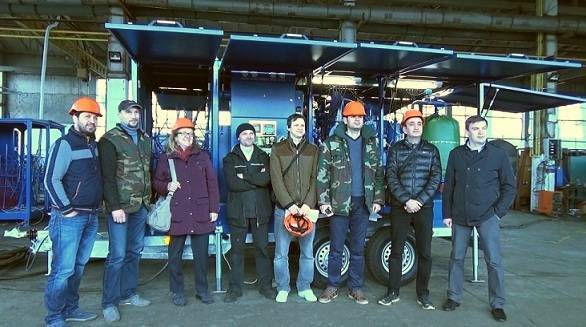 On April, 27 the Turkish delegation visited the GlobeCore facilities. The aim of the visit was to check the readiness of the CMM-8.0 unit for commissioning. General Directorate of State Hydraulic Works was founded in 1954 as a main governmental body in Turkey, responsible for development, planning, regulation and servicing of natural resources. Project management, construction and servicing of hydroelectric power stations are also included in the sphere of its activities. One of the main parts of the hydroelectric power station is hydro turbine that brings into action generators that produce electric power. Turbine oil is required to lubricate bearings and reduction gears of these turbines. To perform its functions properly, oil should possess such performance characteristics as resistance to thermal oxidation, anticorrosion, antioxidant, antiwear and anti-foam properties. In the course of operation, turbine oils are exposed to gasses, gaseous products and water that reduces its performance characteristics. The GlobeCore CMM-8.0 is designed for degassing, dehydration and filtration of turbine oils. If to apply this equipment in time, it can extend the service life of oil, save you money on the new oil purchase. The Turkish delegation was present during the testing of equipment that proved the readiness of the CMM-8.0 unit for operation. The signing of the Work Completion Certificate was the logical result of this visit. We had also a great opportunity to communicate with the employee of Andritz Hydro LTD – Irsad Akaydin. That’s what he said: “We have arrived at the GlobeCore production facilities to test the equipment. Everything was great. I haven’t heard about GlobeCore technology before that’s why we gained great experience visiting this company. We are also very happy to have visited production shops and got acquainted with the peculiarities of the works carried out”.